Owing to our expertise in the domain, we have been able to offer Roller Conveyors that are widely used for industrial purposes. With our years of experience & in-depth knowledge in this field, we are engaged in offering a quality-assured array of Roller Conveyor. We are offering to our clients, Power Roller Conveyors, which are normally used as temporary conveyors where the application is not permanent. These are also used when the conveyor is needed in a flexible environment. This are used to move heavy component over the roller and finds its uses in AC & Refrigeration Industries, Mechanical Industries and in Many more industries. We are a prominent manufacturer and supplier of Screw Conveyors which are reckoned in the industry for features like durable finish standards, high performance, sturdy construction and efficiency. Interroll Conveyor Line modules are used for the transportation of small, light and heavy products normally over short distances. Using Interroll Conveyor Line modules, a conveyor system or machine manufacturer can concentrate on more important tasks such as system integration, controls, installation and commissioning thus saving time and money. 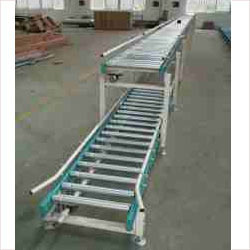 We offer Powerised Roller Conveyor to our clients.